Actually achieving agreed conditions, is that your top priority too? By now, most organisations have made considerable progress in the automation of processes, such as P-to-P, e-invoicing and EDI messaging. However, the way in which organisations register their supplier contracts often lags behind. They also sometimes lack insight into the agreements based on these supplier contracts. Contract and condition management is extraordinarily relevant in most purchasing organisations and departments. There are even sectors in which operating results are significantly dictated by the supplier conditions. It is precisely in those organisations that you would expect realisation of the agreed conditions to have top priority and to be well organised. In practice however, this is not always the case. Research and experience shows that there may be significant deviations between the supplier income actually achieved and the amounts to which companies are actually entitled according to the conditions, in both (very) large and medium-sized companies. While it is evident from this experience that many aspects are well organised, it is equally clear that considerable profits can be made around the conclusion of supplier agreements. In recent years, many organisations have been able to cash in on more than thirteen million euros of unclaimed purchasing conditions after all. Per organisation, this translated into 2 to 9 percent of the total supplier income over a 5-year period. This has a significant impact on the operating results! In creating a robust process for settlement of supplier contributions, it is extremely important to effectively safeguard the following elements. Register (annual) contracts centrally and digitally. In practice, contracts are registered in many different ways. Many contracts are not centrally and digitally archived in a contracts database. They sometimes quite simply sit in a file in a cabinet. Supplier contracts are managed by the parties who organise them to start with, often the responsible buyer, within many organisations. Very few people are then aware of the content of such contracts, outside of the contract manager. Provide access to conditions of annual contracts and temporary deals. It should be standard procedure to access the conditions registered in the contracts, in order to enable monitoring and control of the value represented by those contracts. It is imperative that this information is accessible, but unfortunately this is often not the case. The conditions are often managed by the parties who enter into the contracts to start with. There is no central insight into the conditions and into the value they represent. It then becomes tricky to guarantee the comprehensiveness of the supplier income. Companies are even more likely to lose sight of temporary agreements, as compared with their annual agreements. Such temporary agreements are often reached between buyers and suppliers via e-mail. Very few people are privy to the ins and outs of these deals. As long as these e-mail agreements are not archived centrally, there is a great risk of no settlement taking place with the supplier in the end. The risk is further enhanced by personnel mutations, which are surprisingly common. Ensure reliable internal spend reports. A good spend report – which articles/brands have we purchased from which suppliers at what price? – is essential in order to pass on the correct amounts to the supplier. Even when the supplier sends a credit note for the amounts payable, a good internal spend report is vital. After all, suppliers can make mistakes, consciously or otherwise, in the amounts to be settled. Ensure job delineation. It is important to distinguish between the responsibilities within management, control and functional positions. Within an organisation, a buyer may be responsible for concluding contracts and deals with the suppliers, and for issuing invoicing assignments to the administrative department. This makes a single person responsible for many different tasks and responsibilities, with all the inherent risks. While there is not only a serious risk of the amounts to be invoiced being ‘forgotten’, this situation also does not exactly hinder the transfer of results between the various years. Buyers are commercial after all, and are often faced with bonus-related targets. Once this year’s target has been achieved, it is very tempting to transfer part of this year’s conditions yet to be invoiced, to next year. Is the supplier income complete? Many organisations struggle to estimate how complete the supplier income has been in the past. It is after all tricky to estimate something in which you have no insight. 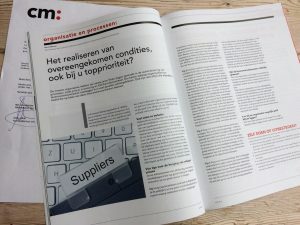 Organisations often rely on the supplier income achieved in relation to the development of the purchase value, as a form of monitoring the comprehensiveness. If it was 2 percent last year and is now 2.2 percent, all would seem well. However, if the conditions were already out of sight in previous years, there is little chance of them now being visible. And so the supply income is still incomplete. Could your organisation be neglecting money? As a quick check of whether or not money has been neglected somewhere, you can either conduct your own random test or call in a specialised company to conduct a quick scan. Using a number of specific process and accounting analyses and random tests, you gain a picture of the strengths and weaknesses in the process. An estimation is made of the risk of money having been neglected. If that proves to be the case, a recovery project may be worthwhile. Before initiating a recovery project, it is important to communicate the great need for everyone to fully cooperate, within the organisation. The project is aimed at gaining certainty regarding the comprehensiveness of supplier income, while improving the internal processes. ‘Naming and shaming’ is certainly not the intention. When executed in this manner, the necessary information will be obtained. All contracts concluded over the past 5 years (maximum) must first be rendered visible; this is the statutory limitation period applicable in the Netherlands. This can require some serious searching in some cases. Contracts may be stored at various locations. Cabinets, digital archives, any other methods in use at an organisation (or previously used over the past 5 years). All the conditions can now be distilled from these contracts, which may result in entitlement to financial compensation from a supplier. All these conditions are registered in a database. It is essential to also gain insight into any temporary deals. A complicating factor is that these temporary deals are often agreed between buyers and suppliers via e-mail and are therefore not centrally archived. A tool can possibly be deployed for this purpose, depending on the organisation’s internal policy. This tool checks mailboxes, providing insight into any relevant deals. The relevant spend per supplier can then be determined. The total claim is then calculated per supplier, based on the spend and the conditions. And so the REQUIRED position per supplier becomes visible. The financial administration then serves as the source of determining the ACTUAL position per supplier, based on the amounts actually received. This preparatory work is followed by the actual analysis. At the invoicing level, the received/invoiced amounts are linked to the conditions and the comprehensiveness of the conditions received is assessed. Contact is sought with those suppliers with whom there has not been full settlement. This contact with the supplier should preferably not be left to the buyer, but should rather be undertaken by someone from the project team. This is important in order to keep the lines clean and not to have any impact on the relationship between the buyer and the supplier in question. A recovery project is a (labour) intensive process: large numbers of contracts and conditions are assessed in detail as to whether the settlements have been comprehensive. Checking the very first condition is just as important as checking the very last. That requires a great degree of discipline in the work. A recovery at a medium to large organisation will take a number of man years – 2.5 to 3 years is no exception. a final report is absolutely vital in such a recovery project. This is a valuable document, full of findings and recommendations, intended to fine-tune internal processes. There are a number of tools available on the market for organisations looking to truly make progress in the management of their purchasing conditions. These tools include a contracts database, where all concluded contracts and their conditions are registered. Some tools have an interface with which the spend data can be input from an ERP system, for example. The system can then determine the claims at the supplier level, based on the registered conditions and spend data. Author: Gerrit Eikenaar Gerrit Eikenaar MSc is a partner at Recentes, specialised in supplier conditions and conditions systems.